We’ve been waiting to execute this dinner for a long time. Almost as long as you’ve been waiting for this recap. Apologies, it’s been crazy busy. The genre itself has some really fun flicks but we played deep into it not only with the food but right down to the menu design. Details people. Details. 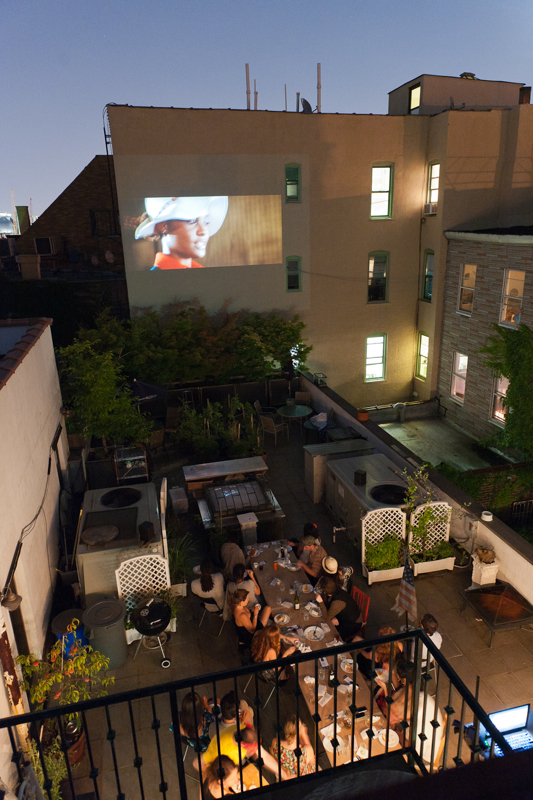 For those who are unfamiliar with our dinners, Reel Tasty is Forking Tasty’s summer supper club where Aimee, my co-chef/host, and I screen a movie on a 2 story building while our guests sample some of our latest and tastiest gourmet dishes. From the hair pick to the dessert we packed as muck blaxploitation as we could into every edible and non-edible morsel of the evening. Here’s the rundown. 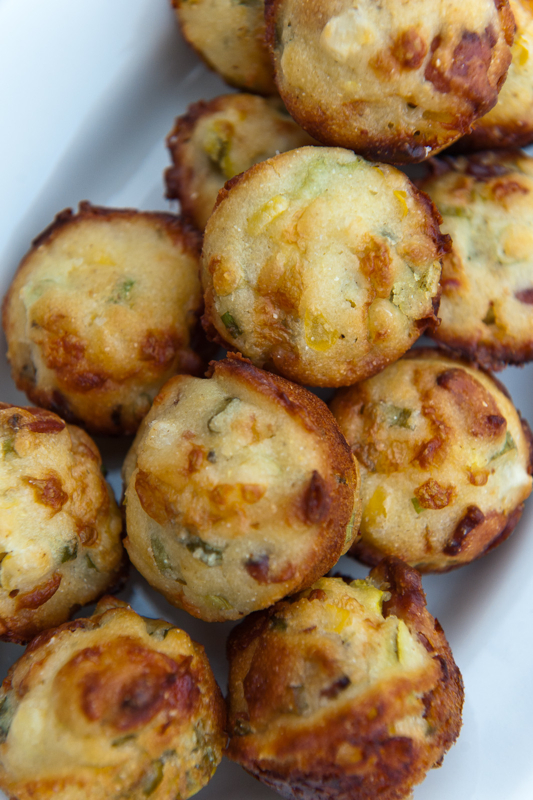 Upon arrival our guests snacked on some quick pickled okra and a few bacon-jalapeno mini corn muffins. Just a lil’ stomach opener. As they munched and became acquainted we provided a little beer and wine to wash down the snacks. A couple Honey Brown’s and some Porkslap cans would do the trick for the beer. The wine proved a bit trickier and so I turned to Lily, of Dandelion Wines, as usual. Considering the theme and the cuisine she provided two excellent choices. The white was a classic Cotes du Rhone with a honeysuckle nose and fruity notes of white peaches and apricots. 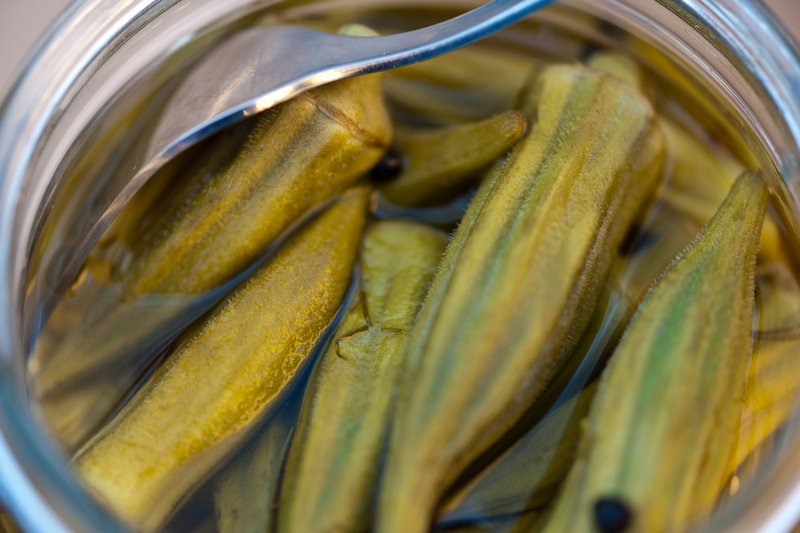 Delicious and addictive! DOMAINE DE LA BASTIDE COTES DU RHONE BLANC 2010. The red was aptly named and as bold as the movie genre’s collective statement. THE PEOPLE’S ZIN 2009 is a full and jammy California Zinfandel with notes of smoke and blueberries. 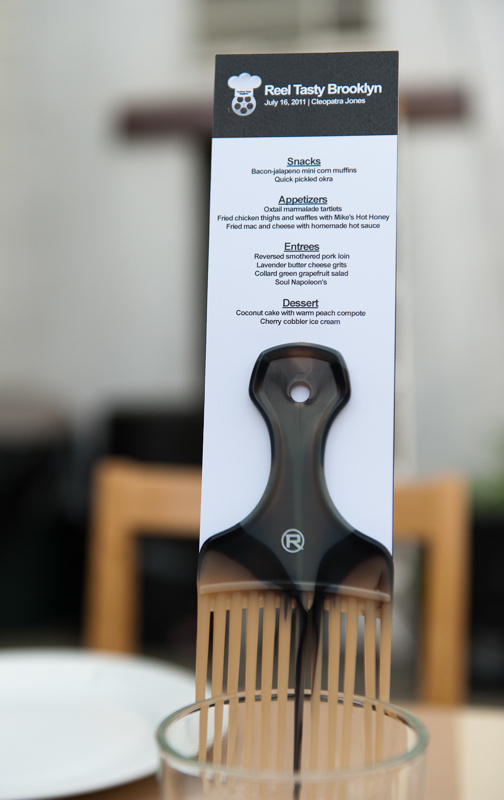 Perfect for soul food and finding a soul mate! 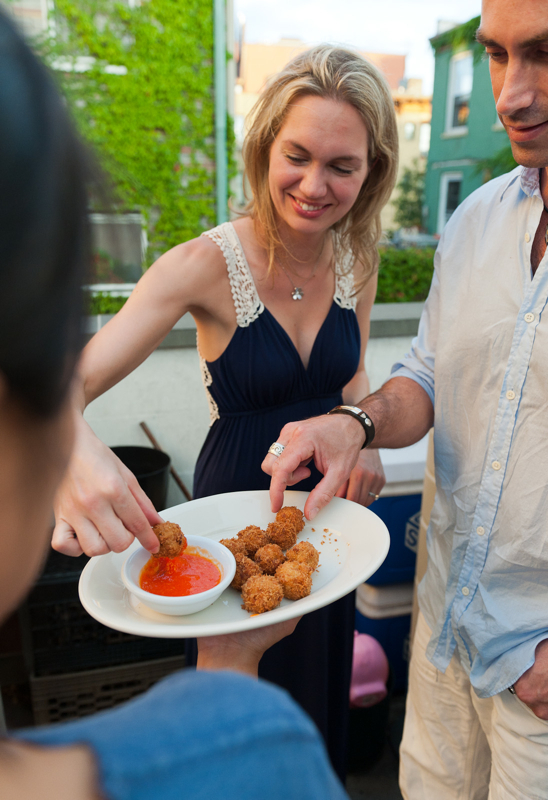 As our final guests arrived we started immediately with our carefully curated appetizers. 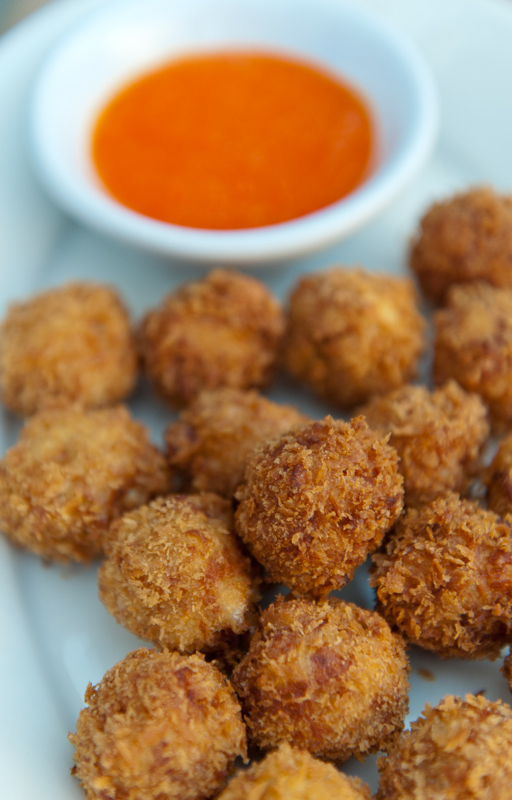 First up was fried mac and cheese balls with homemade hot sauce. 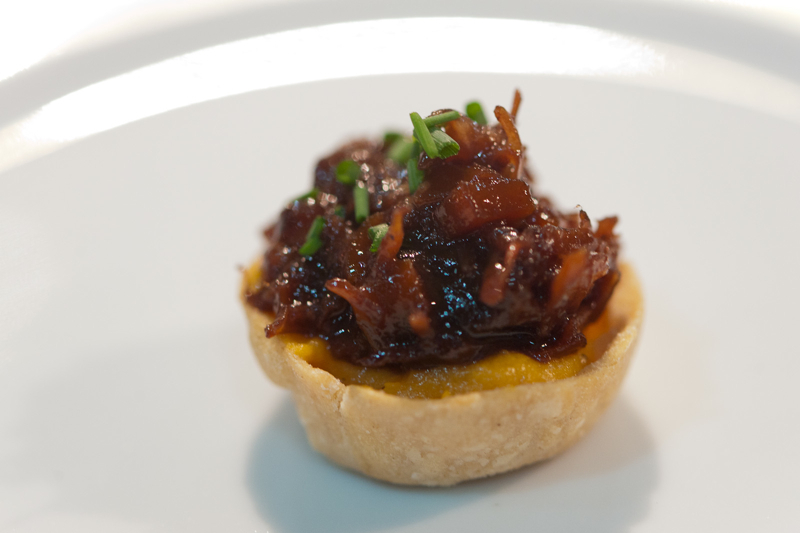 We followed that with oxtail marmalade tartlets. 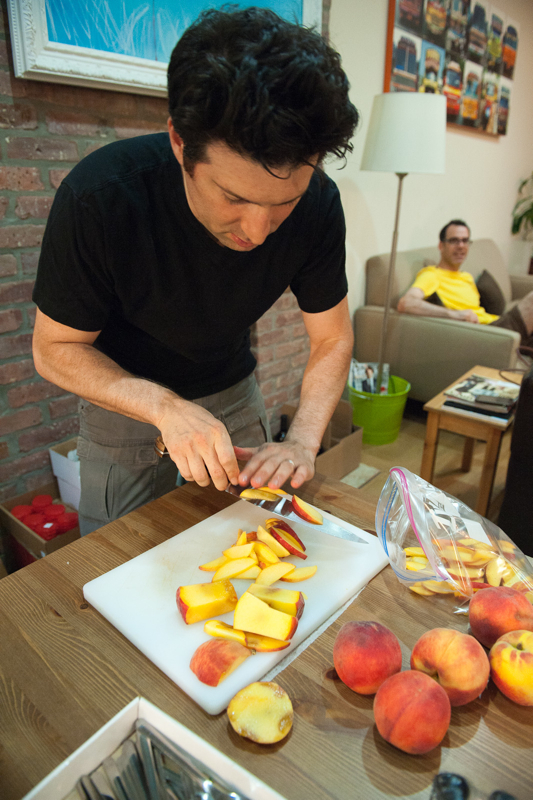 While that kept our guests busy chatting and chewing, major kitchen prep kicked into overdrive. 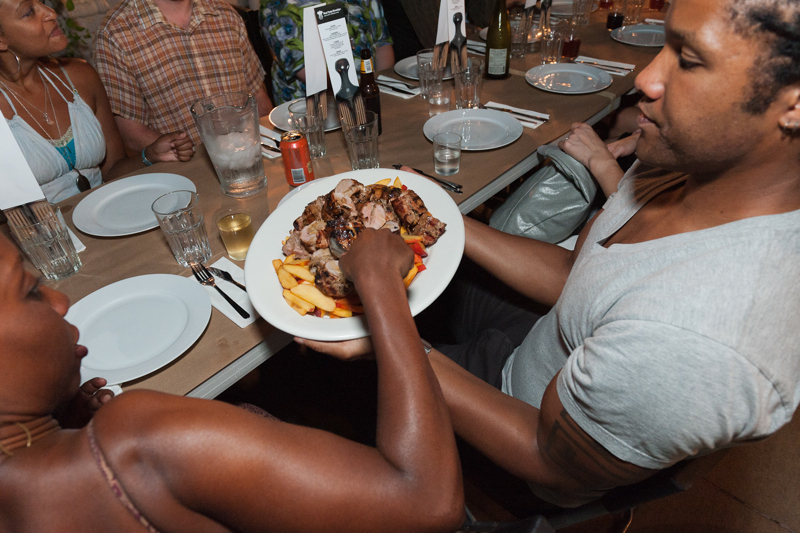 Grits, pork and the final appetizer spun the kitchen into a momentary frenzy. In the midst of that very long, hot, frantic moment of food prep Aimee plated and served the final appetizer. One in which we had been dreaming of making a reality since last season. 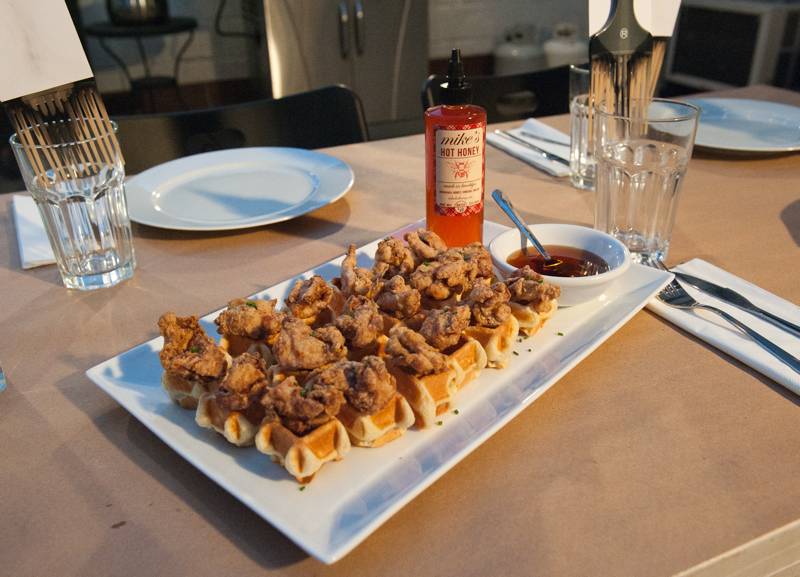 Fried chicken thighs and waffles with a little Mike’s Hot Honey to drizzle over top. This one was so good I had to include a double picture of it. And, it seemed as though our guests felt the same. That long moment seemed to drag on longer than expected. The kitchen frenzy continued as the grits thickened and the fish slide into the oven with it’s bright yellow top coat. 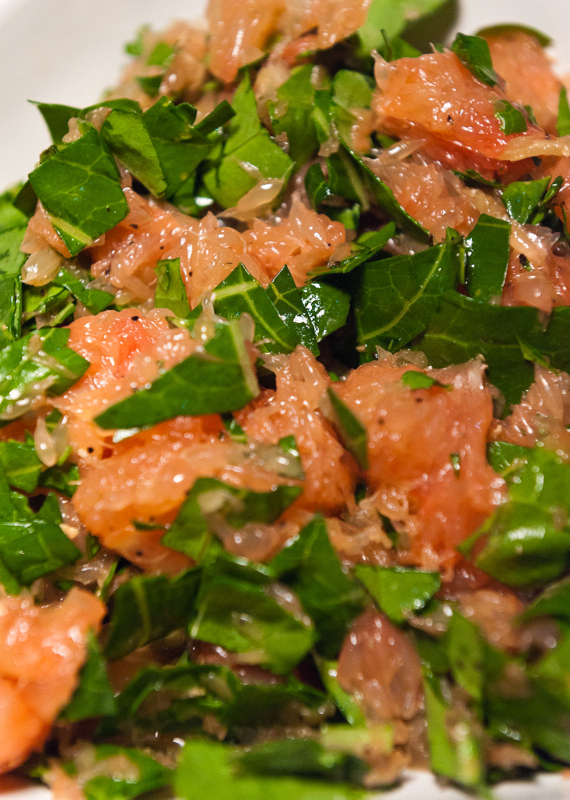 Over at the prep table the raw collards, risky but delicious, were being combined and tossed with the grapefruit and dressing. 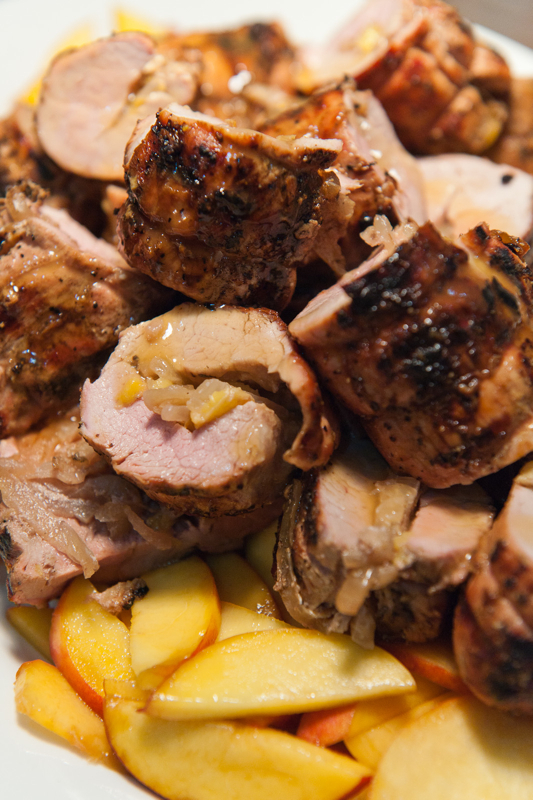 Simultaneously the pork was being freed from it’s butcher twine restrains and drizzled with a touch of peach nectar reduction. 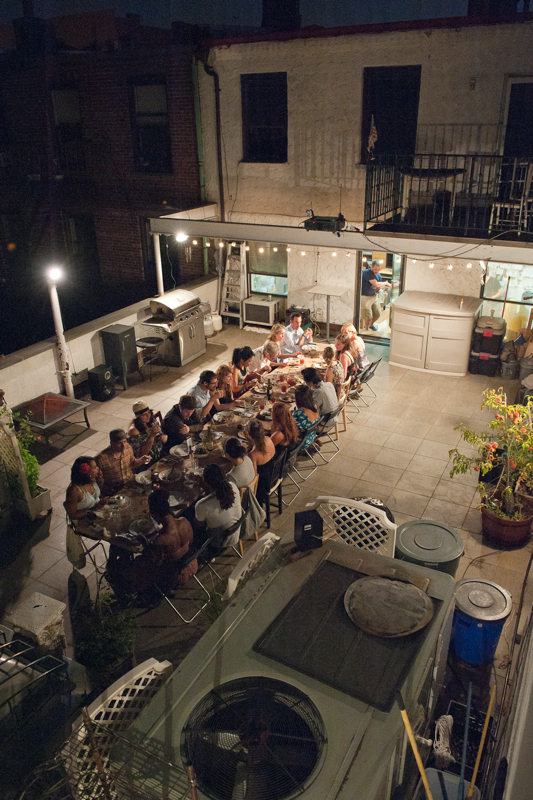 Our guests seated themselves anticipating the entree parade that was just minutes away. First up was our salad. 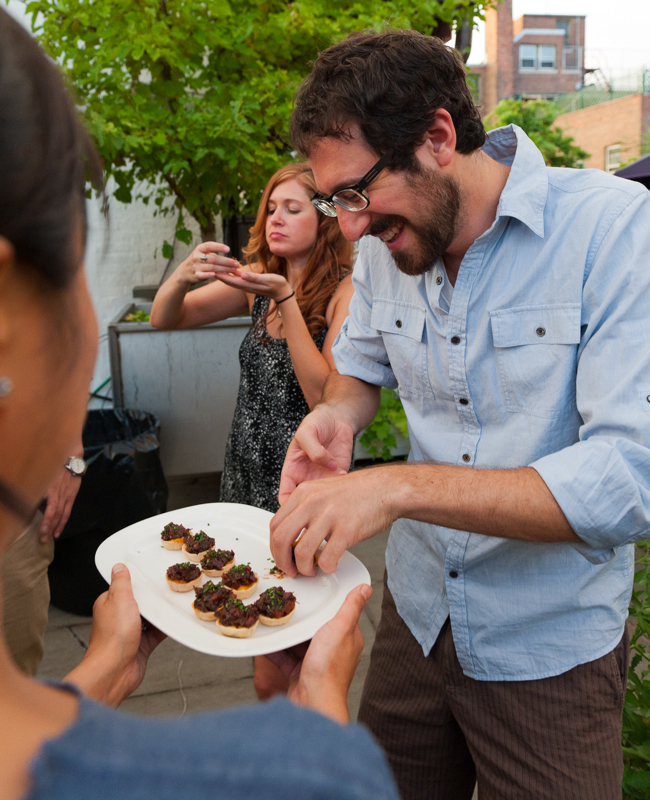 We really wanted to incorporate collard greens but we didn’t want to serve the standard. We thought keeping the greens fresh and raw would be more summer but we had to figure out a way to cut the bitter and mellow the texture. Grapefruit along with very tiny pieces of green did the trick. Next up was reversed smothered pork loins. 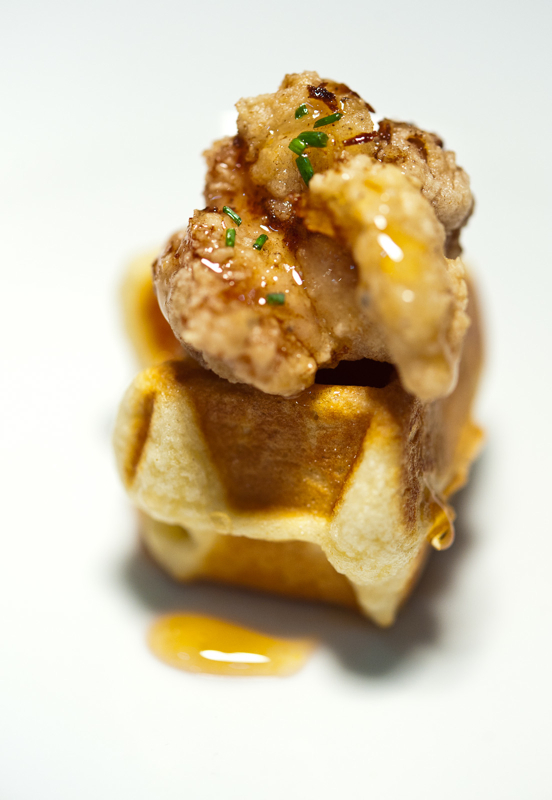 Again we wanted to be true to soul food but wanted something new about this dish. 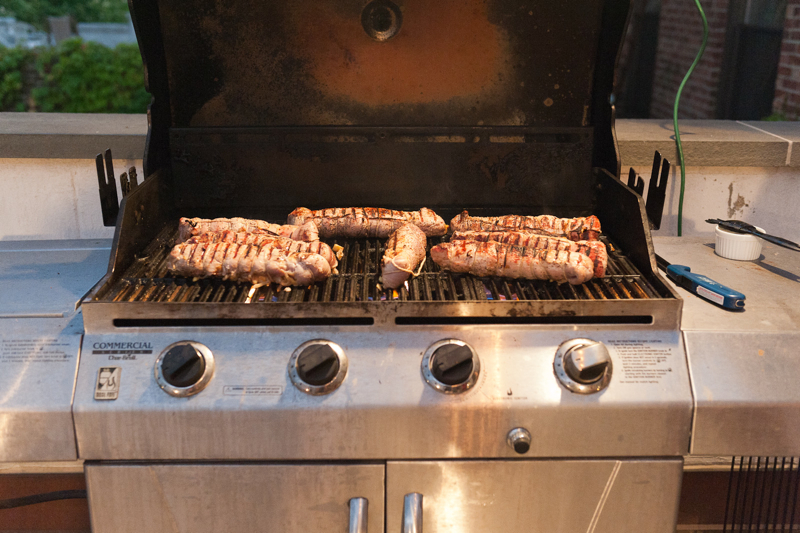 We struggled with using a pork loin because it was the antithesis of where soul food came from, cheaper cuts of meat rather than the most expensive. After we got past that we decided to smother the pork although the twist is we did it from the inside out using an onion and peach filling. 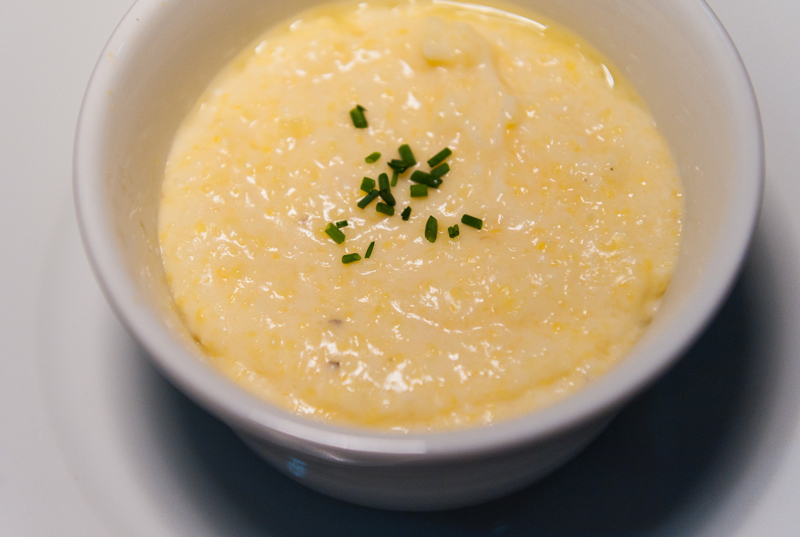 Third were some uber rich, crazy creamy grits that we finished with a little lavender butter. Lavender is a tough spice to work with because it can become very floral and over power everything. It’s delicate scent is deceptive when used as an ingredient. 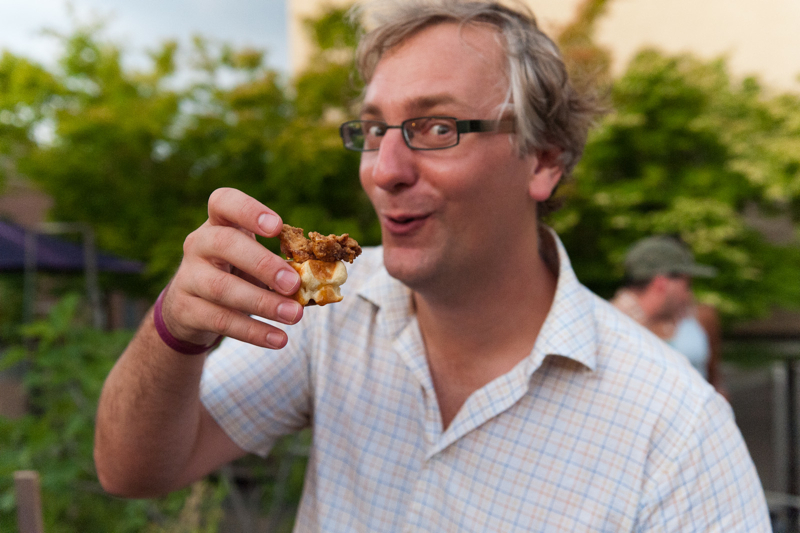 We found the perfect balance earlier in the week in the test kitchen. Here we also discovered the perfect finishing cheese, a creamy montina. 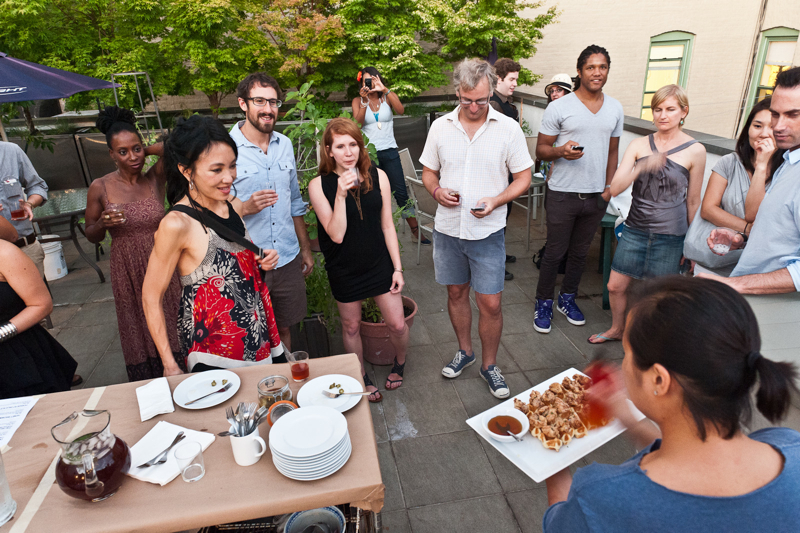 The final dish out was something we created out of our deep commitment to the soul food/Blaxploitation theme. 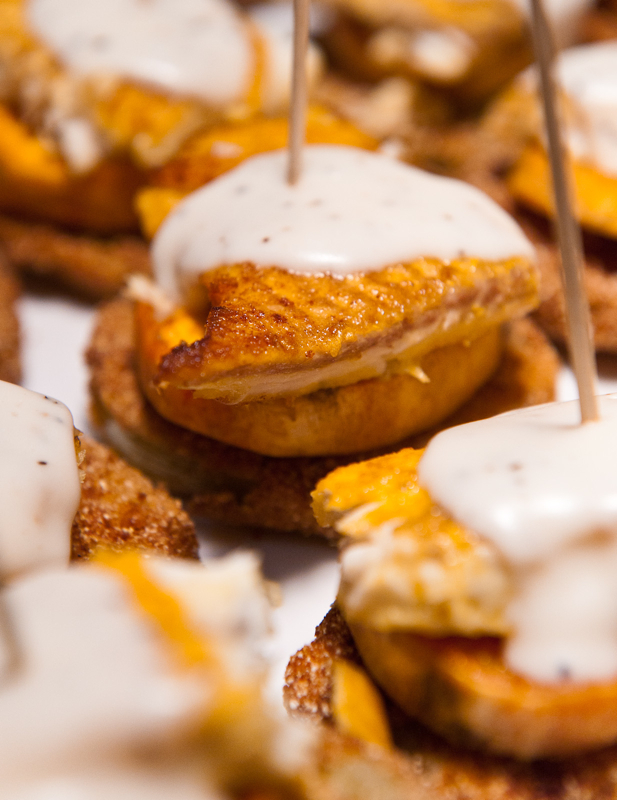 We couldn’t imagine not having sweet potatoes and green tomatoes represented at the meal. And, I have a personal love for the heavy thick bite of biscuit gravy. Taking all that into consideration the Soul Napoleon was born. A roasted sweet potato served as our base. On top of that we stacked a fried green heirloom tomato and then a perfectly crisped piece of cod dusted with turmeric. To finish it, a small dollop of bechemel sauce. Our guests dove into the plates with the same excitement and dexterity of the 6 foot 2 special agent that would soon make her debut on the deck. Shortly after the final bite of pork and slup of grits was completed Cleo jumped to the big screen and our Blaxploitation evening was propelled to the next level. Hot sauce popcorn was served up as a snack while the kitchen started prepping the desserts. Just before the movie came to a close we snuck out a few sweet treats. 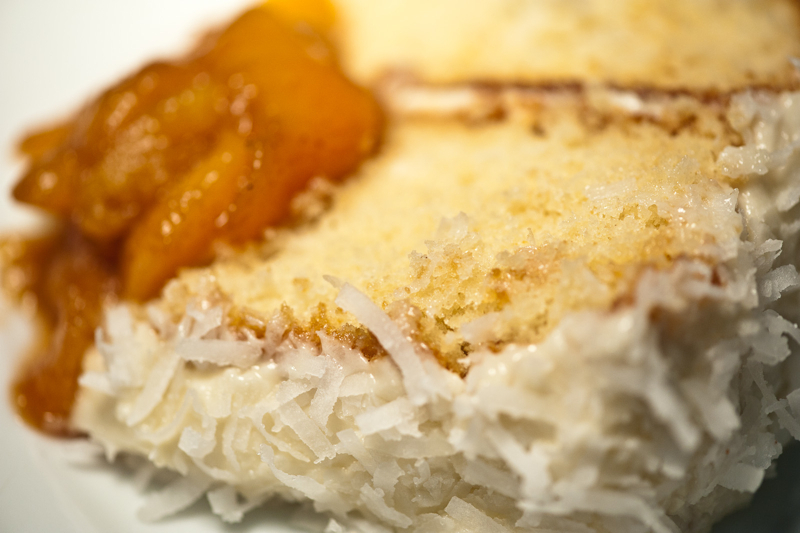 First a piece of coconut cake with warm peach compote. 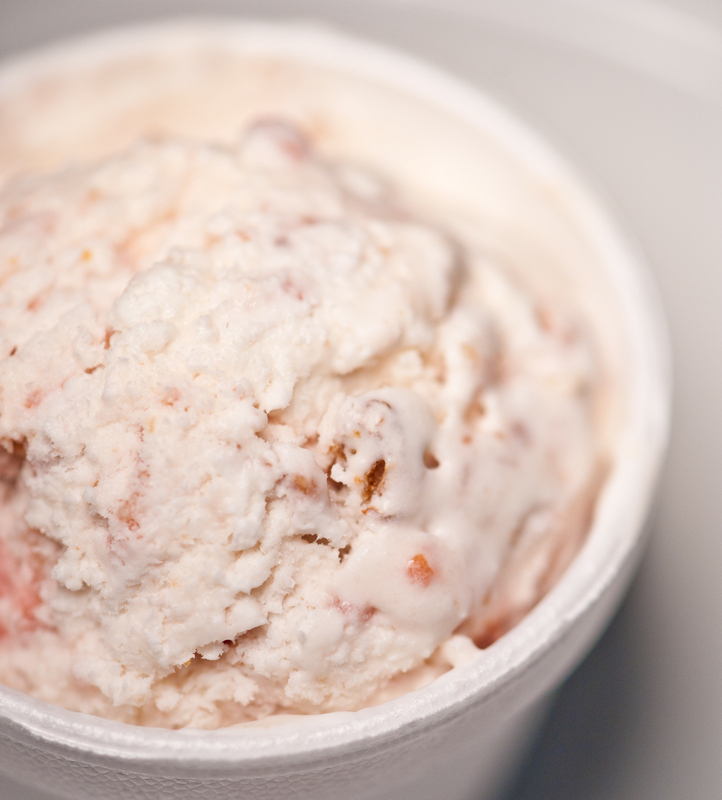 That was followed by a refreshing scoop of cherry cobbler ice cream. Come on! How could we finish a soul food meal without cobbler? 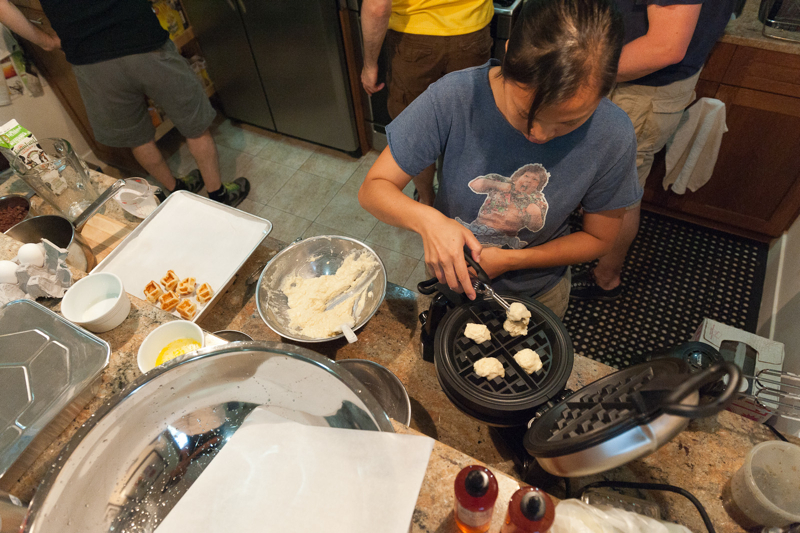 Of course no recap is complete with out recipes and a shout out to the crew. These nights wouldn’t be possible with out them. The biggest thanks, as always, goes to our guests. You guys are the best. 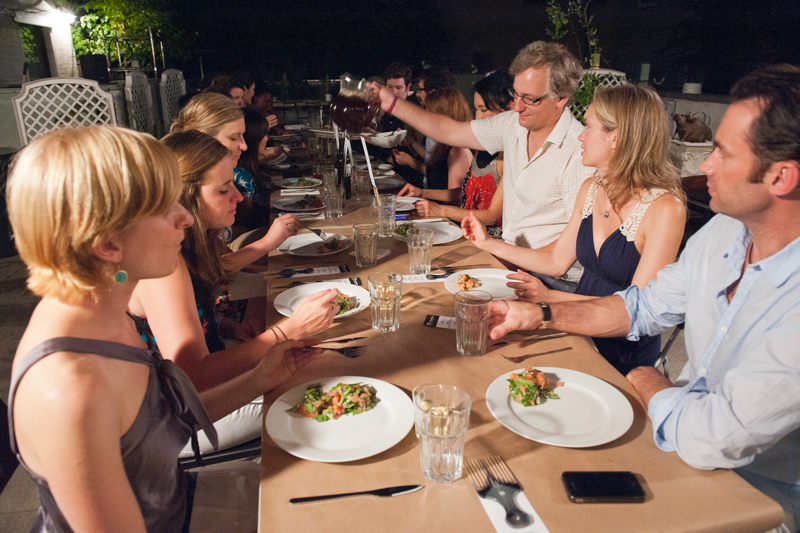 Our next dinner is August 27. 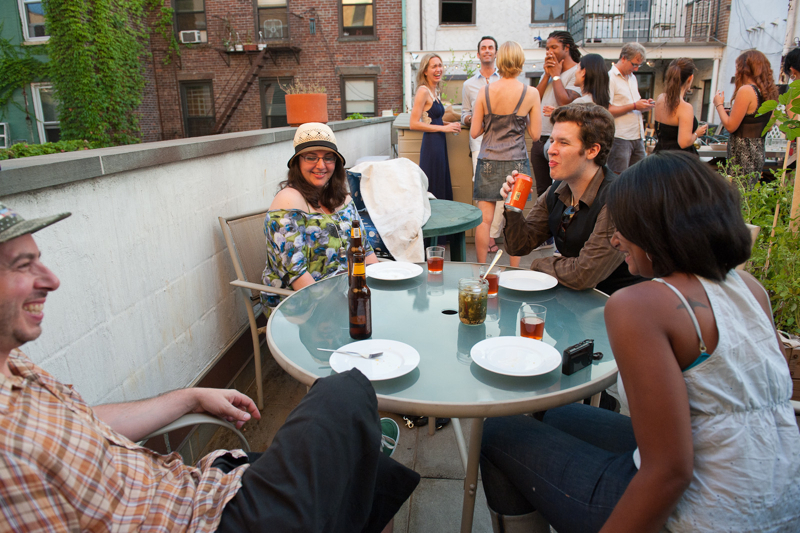 If it stays this hot you might just want to Escape from NY 😉 We can help with that. Hope to see you all soon. 1. Place the milk, water, and salt into a large pot over medium-high heat and bring to a boil. Gradually add the cornmeal while continually whisking. Once all of the cornmeal has been incorporated, decrease the heat to low and cover. Remove lid and whisk frequently, every 3 to 4 minutes. Cook for 20 to 25 minutes or until mixture is creamy. 2. Add butter to a small sauce pan and melt. Add in lavender springs. simmer for 10 minutes. drain butter to remove lavender. Set to teh side. 3. Remove from the heat, add the pepper and butter, and whisk to combine. 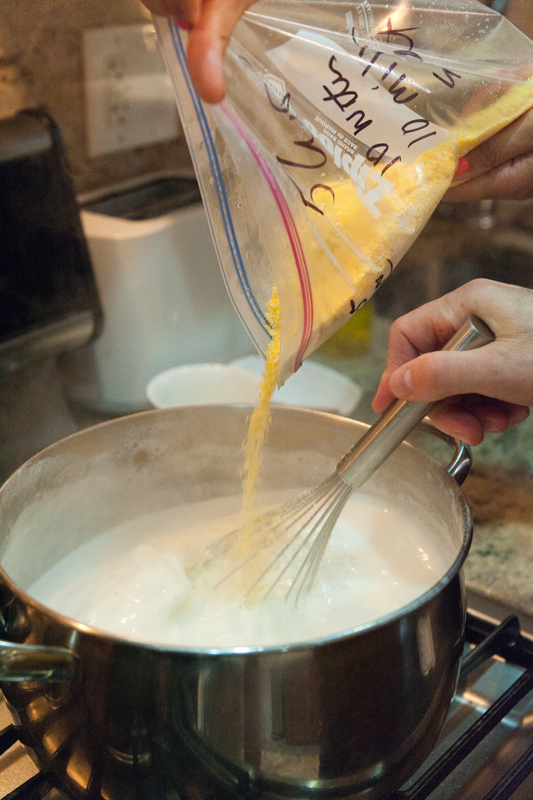 Once the butter is melted, gradually whisk in the cheese a little at a time. Serve immediately. We are the well fed champions!!! Go ahead…play with your food.